Home» Blog & Tweets » #SteveJobs Bio in #ComicBook Format: Buys into Approach From JLC Group 2008 BlogWe Told You So!! 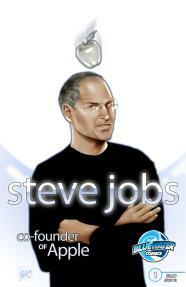 #SteveJobs Bio in #ComicBook Format: Buys into Approach From JLC Group 2008 BlogWe Told You So!! According to AP, Steve Jobs is cementing his iconic image with the release of a bio in comic book format. Steve Jobs, the public face of Apple Inc., is getting a biographical comic book. Publisher Bluewater Productions Inc. said Monday it will bring a 32-page biography — titled “Steve Jobs: Co-Founder of Apple” — of the iconic CEO to comic book shops, bookstores and online retailers Aug. 24, detailing his life and career. Before you click on the the full story, .according to Associated Press. look back to the September 2008 blog post right here, and you’ll understand why we’re patting ourselves on the back; after all, we’ve been promoting this very idea for years, and its one that has since become a proven branding application. The issue isn’t why Jobs waited two years to embrace the application that we’ve long advocated as a being a key weapon within a larger branding arsenal, the issue is that he’s the most recent icon to do so.